Maintaining a firm grip on quality management system processes is essential for most organizations today. But the path to a successful transition to automated quality management system can be complex. If the time is now for your company to implement or improve your automated QMS solution, the good news is this is the first step toward improving operating efficiency and saving time and money in the process. 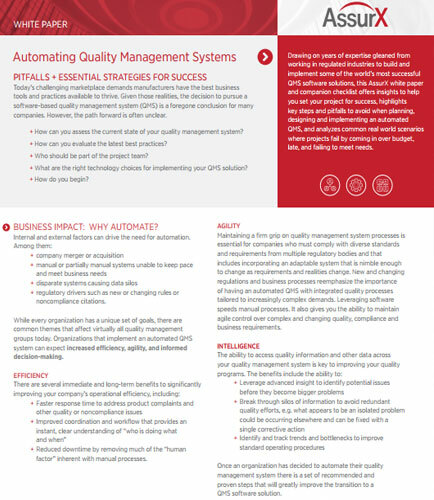 This whitepaper provides insights on how you can assess the current state of your quality management system and what are the right technology choices for implementing your QMS solution. What are the immediate and long-term benefits to significantly improving your company’s operational efficiency? What should a high functioning QMS system implementation team look like? How to build a successful QMS system implementation team? What are the unique requirements and constraints that must be considered when designing a comprehensive, end-to-end solution for QMS implementation?